He might not know it yet, but the subject of The Hunted is right where Adrian Ghenie wants him. This baboon has been cornered on a coffee table. That’s the kind of place you would expect to find a book about art. And indeed this photolike monkey fades into a black outline on what could be a cave wall. So…art’s connection with hunting dates back to prehistory. But who in these enlightened days or places would ever hunt a baboon. You wouldn’t eat the thing. Though if you were you a painter, you might want to study it. This painting is the most colourful in Ghenie’s show, as if the whole canvas is a simian face or backside. It may be out of place in what looks like a modernist home in northerly climes. But the artist has an understanding with the creature, who allows himself to be painted. A mix of found images and scraped paint make his work look like it is peeling away, much like the bark on those birch trees outside. What else might they peel away? Someone here has taken off his jacket and the baboon’s glare might even divest you of the trappings of civilisation. This painting brings out a primitive streak. Such an exotic encounter is surely what a gallery visitor is hunting for. And if they happen to be a collector, well, the monkey stands no chance. 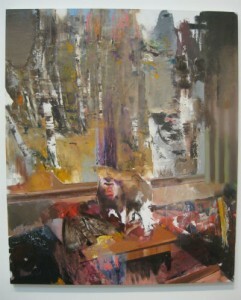 Adrian Ghenie can be seen at the Haunch of Venison London until 8 October 2011. See gallery website for a film about the show, but also check out this sceptical review on A Kick Up the Arts blog.